Staff Selection Commission is the organization which is conducting this exam. This commission is attached to the department of personnel training. Its chairman is Ashish Khurana. They release recruitments according to their schedule. They conduct examinations to recruit candidates. 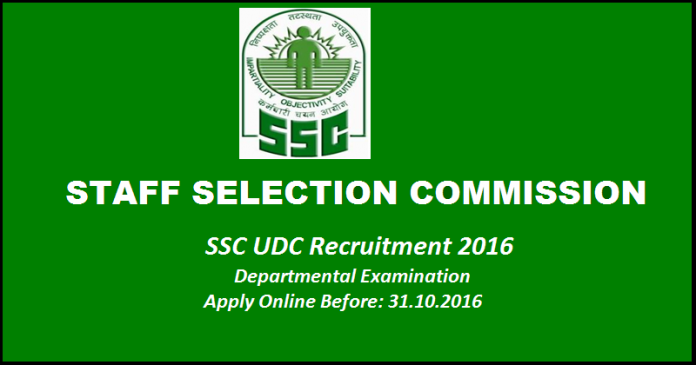 Now it is coming with SSC UDC Recruitment 2016. Interested applicants can make registrations immediately. The departments participating in the organization are central secretariat clerical service, armed force head quarters clerical service, railway board clerical services, Central Hindi Directorate, election commission of India, central vigilance, the ministry of external affairs, central administrative tribunal, the ministry of environment and forest. The competitive examination is conducted at various examination centres like Delhi, Allahabad, Mumbai, Bangalore, Guwahati, Kolkata, Chennai, Chandigarh and Raipur. Applicants who are interested in this Upper Division Clerk Grade Limited Departmental Competitive Examination can immediately register their name. They can download the application form or write your details on A4 paper and submit directly. Eligibility for this exam is applicants who are working as lower division clerk permanently or temporarily at the following departments can apply for this notification. Age limit is not more than 50 years. The selection process is based on the computer based exam. The total exam is conducted for two papers. Paper 1 is conducted for 200 marks on the objective type and 100 marks for the conventional type. The last date to submit the UDC application is October 31st, 2016. So eligible candidates, please hurry up to fill your application. In our website we will provide more information about SSC UDC latest updates. So please stay tuned to our website.